Fiction – paperback; Roast Books; 140 pages; 2010. Review copy courtesy of the publisher. Reviewing a short story collection is always problematic. Do you take a story by story approach, or a general overview? In this instance, I’ve opted for the latter. 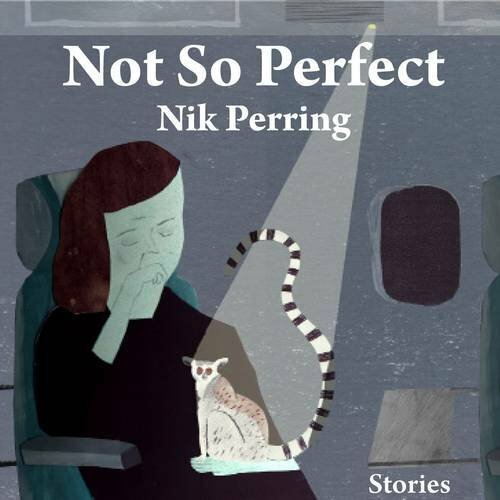 Nik Perring’s Not So Perfect is a sweet collection of 22 stories, some of which are no more than a page long. And given the cute size of this book, which is 130mm x 130mm, that’s very short indeed. It can be easily read, cover to cover, in less than an hour, though I suppose you could drag it out, ration yourself to one story a day, and make it last three weeks. But if you are anything like me, reading one isn’t quite enough and before you know it you’ve greedily gobbled up the whole book in one short sitting. Most of the stories are about human relationships and the not-so-perfect lives people lead. All of them have surprising little twists or moments that make you go a-ha! And many are just downright kooky, but a lot of fun all the same. I was particularly taken by the first story, Kiss (just four pages long), in which an older man seemingly takes his much younger wife for granted. But then he dies and weeks after the funeral his widow notices that the flowerbed in the garden looks different. Her late husband had planted the flowers so that when they bloomed they would spell out a message. But to find out the message you will have to read the story for yourself! Let’s just say it’s a bittersweet tear-inducing one. Similarly, I quite liked My Heart’s in a Box (four pages and two lines long) in which a man allows the woman he loves to cut his heart out and keep it in a box. Okay, so it’s sort of preposterous, because how on earth would the man survive an operation of that nature, especially as it was conducted on the kitchen table, but in this story you have to suspend belief. It’s actually a poignant little fable which explores how the love between two people grows and changes with time. Initially, the woman keeps the heart on display in the kitchen, later it is put on the mantel piece, before it is moved to the bathroom, then the hall and then the bedroom. Finally it’s put in the garage “on the windowsill, with the slug pellets and matches, with the almost full bottle of turps and a dusty bottle of champagne we won somewhere”. Sadly, the quality of the stories is slightly inconsistent and there are some, including Shark Boy, which are just plain odd. But overall this is a fun, occasionally subversive, collection. I really like the short story as an art form. It can be a bit hit and miss sometimes, but this collections sounds interesting. I wonder if it will be published in Oz? Sounds an interesting selection of tales. I have no problem whatsoever in suspending my disbelief if the author makes it all feel real and the two tales you mentioned made me want to read the collection. I love the cover. I think quirky sized books seem to be a new trend, I received Light Boxes which is very diddy, so diddy I can’t find it again! I just noticed this and wanted to say thanks for taking the time to review. I’m thrilled there was something in it for you. Violet, you can buy it direct from the publisher for £9.99 postage paid to Australia. I do like quirky sized books, just for something a bit different. They always make nice presents, don’t they? I’m not familiar with Light Boxes. Who’s it by? Thanks for leaving a comment, Nik. And the very best of luck with the book! Am sure it will be a great success. Thanks, Skippy, thats an even better deal! A pleasure. And thanks again for the review AND for the good wishes.